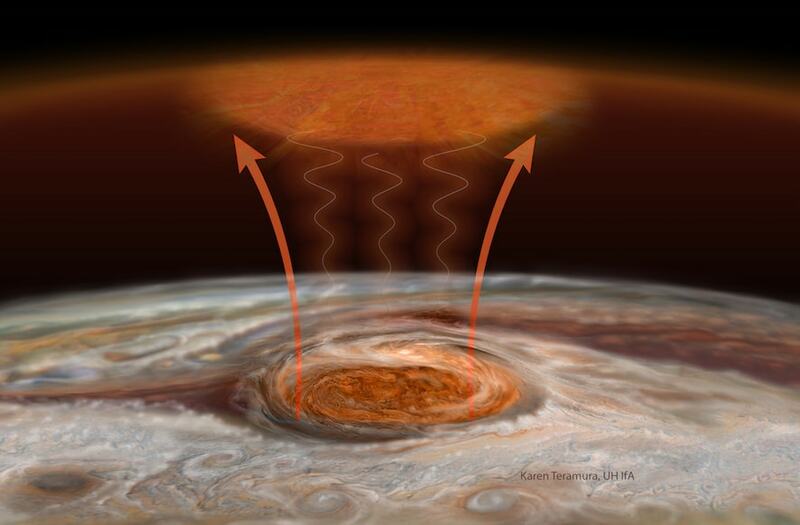 One of the largest remaining questions in understanding the upper atmosphere of Jupiter, the outmost layer of the atmosphere, is: ‘Why is this region so very hot?’. Out where Jupiter orbits the Sun, the sunlight is very faint, and cannot provide enough energy to produce the temperatures that we measure.We call this the ‘energy crisis’. Other potential sources are re-distribution of auroral energy, which is injected at the poles of the planet, and wave heating from the lower atmosphere. Until now, we have not understood how important heating from below is. Our team in the Radio and Space Plasma Physics group in the Department of Physics & Astronomy have a long history of characterising the upper atmospheres of Jupiter, Saturn, Uranus, and Neptune using telescopes on the ground observing in the infrared part of the spectrum. We observe emission from the very simplest molecular ion, H3+, and by splitting the light up into its colour components, we can remotely measure the temperature of the upper atmosphere of these planets. However, as our tools and techniques have improved, it is only recently that we have been able to measure temperatures away from the auroral region, down towards the equator. In December 2012 we were awarded time on the NASA Infrared Telescope Facility in Hawaii to perform these temperature measurements of Jupiter. Me and James O’Donoghue, the first author of this recent study and then a PhD student in our research group, travelled out to Hawaii to do these observations. They are challenging to do, but we managed to collect some amazing data, mapping temperatures from the southern pole to the northern pole. 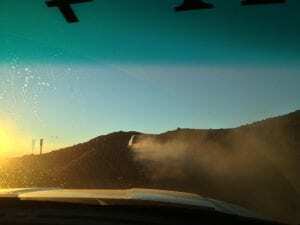 Driving up to the Mauna Kea summit on the 12th of December 2012 to observe Jupiter. The telescopes on Mauna Kea, with the NASA Infrared Telescope Facility on the left. When James, now at Boston University, sat down and analysed this data, he found something completely unexpected. The temperatures above the Great Red Spot are much hotter than anywhere else on the planet. Even hotter than the auroral regions! This strongly suggests that waves, generated in the lower atmosphere by Jupiter’s turbulent weather can travel upwards to the upper atmosphere and deposit lots of energy there, heating it to over 1,200 Celsius. We were very surprised by this – wave heating has been regarded as a relatively minor source of energy to the upper atmosphere, but these results clearly show that waves can transfer truly awesome amounts of energy between the two regions of the atmosphere. Artist impression of how waves generated by the Great Red Spot storm heats the upper atmosphere. This finding have important implication for the energy crisis. Now that we have directly observed the effect that waves can have on the upper atmosphere, heating it to be hotter than anywhere else on the planet, then we may speculate that smaller storms can also transfer significant amounts of energy to the upper atmosphere. It is truly exciting to be in the vortex of a discovery, on the verge of solving a question that has been outstanding for a very long time. Time will tell, however, if our new theory is correct. We already have some new data in hand, taken with the 10 metre Keck telescope, that will take the study of temperatures of Jupiter much further. The Juno spacecraft, currently in orbit at Jupiter, will be able to provide the close-up detail that we are unable to get from the ground at Earth. It carries an infrared spectrograph which will also be able to see emission from H3+, and will map this emission in narrow swaths. By combining observations from both telescopes on the ground and from the Juno spacecraft, we are entering a new era in understanding the strange and wonderful planet that is Jupiter. This study was recently published in Nature. Henrik Melin is a post-doc in the Radio and Space Plasma Physics group in the Department of Physics & Astronomy at the University of Leicester.